TIME to catch up with the mailbag, as it's been a couple of weeks since the last round-up. And what a few weeks. First there was a stream of resignations over the hacking scandal, which despite allegations of paying police officers has yet to become the corruption scandal which would carry far stronger penalties. This post pointed out that Dishface was the ultimate target of the story and could well be gone by Christmas. "I'd say Cameron could still brazen it out, given Labour's utter complicity in all this, were it not for the fact that (a) the BBC will never, ever report this evenly, (b) he's not got any real personal support among the Tory press and (c) that he is and always has been a total c*nt." Colin added: "First Sir Paul Stephenson. Now Yates of the Yard. By tonight, Inspector Fowler and Constable Goody from The Thin Blue Line will be running the Met." A promise about the journalistic ethics of this blog produced a mixed response, with Freddie saying: "The British public needs to lose its obsession with gutter news." "Sorry but your claim that the BBC is the only journalistic organisation that has its own code of ethics is simply not true. The Guardian's Editorial Code is published on its website and is not so hard to find. And there is, of course, also the National Union of Journalists' own Code of Conduct, which is more rigorous in many respects than the PCC's." Ed: Having experience of the Guardian, I wish their code of conduct included 'paying people on time'. Bloody hippies. Then there was the facepalm moment when Posh Spice designed a naff handbag with a £8,995 price tag and a handwritten note from her ladyship in it. Max said: "Ah but when we will see the FoxBag?" John added: "She is such an unfortunate event in the history of humanity." And Pyers said: "A fool and their money..."
Then Amy Winehouse died, as many famous people seem to do, in time for the Sunday papers. This post about the effects of addiction on those who love an addict seemed to strike a chord. Doodah said: "My family has been living with my brother's addictions and their effects for 20+ years. Your piece was spot on, thank you. Scotia said: "Foxy, that's a very personal and powerful piece of writing." Gillian added: "For me you said it all, I am the daughter of an alcoholic father who died aged 52, anger is still part of my life 10yrs on." Richard said: "Thought your blog post was the best thing I've read over the past few days about Amy Winehouse and her death." Slay added: "Unfortunately, only someone who has seen it / done it can tell a tale so well. An inspired blog. A tragedy." And Pamela said: "8 years into recovery, only after 4 did i realize how selfish i had been.. great blog." Paul added: "Your piece 'Life is a losing game' has an existential weight and daylight clarity which I found arresting and refreshing. I have read it again and again. I guess that makes me a fan." Issy was one of a handful to take exception: "Your piece on Amy is incredibly narrow-minded & naive. It's like telling someone who is suicidal to 'pull their socks up'." "A lot of very creative people are emotionally fragile and unable to cope with the pressures that come with fame/notoriety. Unfortunately, Winehouse's premature death was the obvious outcome of her extreme lifestyle." Ed: I very intentionally didn't venture into a debate on legalisation or cures - I wrote only about how it felt to be me. Whether addiction is a disease or affliction is hard to say, because it's not like a virus you just contract; you have to invite it in. Many people have stood on that threshold and said 'no' - myself included - and others, once across it, have had the strength of mind it takes to come back. I do not like romanticising addiction by saying "oh but they were too fragile to cope without" because if that were true the physically and mentally disabled would be most likely to succumb, and they're not. Addicts are generally highly intelligent but get trapped in a spiral very hard to break out of. I have a lot of sympathy for addicts but far more for the people who try to help them. A simple explanation of economics for dummies caused David to say: "Stuff like this blog is why, despite our differences, I love you." Rachael added: "V clever piece. Now, I'm off to sign on..." John said: "I am disappointed in George, who I had always thought an astute operator. Blaming the royal wedding! Honestly, what he does he take people for?" Then a lady let her boyfriend cover her in tattoos, causing Ray to ask: "If they split up will she spend a fortune on laser removal?" Ian added: "I consider a suntan self-mutilation." And Matthew pointed out: "Tarantulas aren't poisonous. they are venomous to other smaller spiders, their prey, but not humans." Ed: They certainly look homicidal. Ugh. And finally the week ended with the news that the gods of publishing had finally granted a book deal to Yours Truly. Lee said: "At last. Hoorah! It was the Fox Ball branding campaign that swang it. Clever girl." 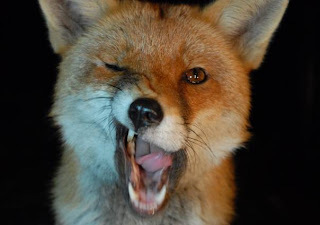 Philip said: "Splendid news, foxy. Well done, girl. Licks lips at the thought of vaguely true stories and vile encounters in the great Metropolis." Harry said: "Turns out you can get it if you really want." 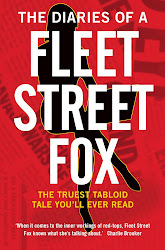 Olivia said: "Congratulations to @fleetstreetfox who I hear has a book deal. Thoroughly and foxily deserved. Can't wait to read it." Minx added: "Congratulations!!! Yr tweets & blogs make me pmsl & u even made me cry once. I'll buy yr book!" Which is a nice end to the week. Enjoy the weekend folks - I'm certainly going to!